Watch out, all you Eastpaks, JanSports and Herschels out there! Aevor (pronounced “ever”) is a fairly new player in the accessories game that wants to gain its share in the world of urban backpacks. Since 2016 the Cologne-based brand is in the market with its core product: the rucksack. According to Aevor’s so-called “Global Brand Owner,” Till Lászlop, the label has found its niche in the “sports lifestyle” segment addressing sports stores such as SportScheck and Blue Tomato as well as specialty bag and luggage retailers. The latter has to do with Aevor’s background. 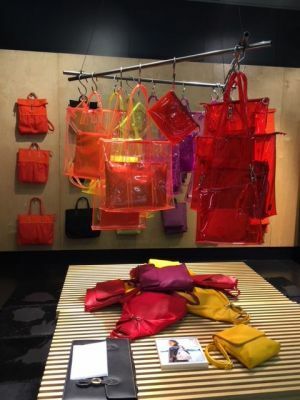 The German mother company Fond Of started in 2010 with kids’ satchels under the name of Ergobag and now runs eight brands catering to different bag and backpack customers, from toddlers to grown-ups (in the street fashion sector its Pinqponq label is a household name). But what kind of backpack does Aevor want to offer that its competitors do not? “Aevor uniquely blends innovative design, well thought functionality and sustainability,” says Lászlop who brings in longtime brand experience from working at companies such as L’Oréal and Asics. Indeed, the clean aesthetics of its rucksacks could have an impact on the crowd of “urban creatives with young minds,” as Aevor calls its target group. When it comes to functionality, the products offer multiple features such as rolltop systems, breathable back parts, waterproof materials and several side and inside pockets. Aevor also adds its bit to a sustainable planet by using at least 50% of PET recycled materials and is partner of Bluesign and the Fair Wear Foundation. Retail prices range from €35 for the Shoulder Bag to €120 for the Travel Pack, a backpack with multiple features. Six models in several colorways are part of the offer that aim to appeal to men and women in the same way. “High rotating products are key for the joint success of Aevor and our partners. Next to backpacks, our development list therefore features volume driving items that yield an even higher rotation, like hip bags or wallets, and at the same time increase brand visibility,” Lászlop explains. At current the D,A,CH region is dominating in sales, but Aevor’s main goal is to simply make the label better known in the market and to extend the volume: “At present, the brand serves around 400 doors in Europe, with a strong focus on internationalization,” says Lászlop naming Denmark and Italy as two examples. For sure, that’s two countries with many urban creatives to reach out to. Titus Dittmann: "Gucci backpacks for skateboarders - unimaginable"